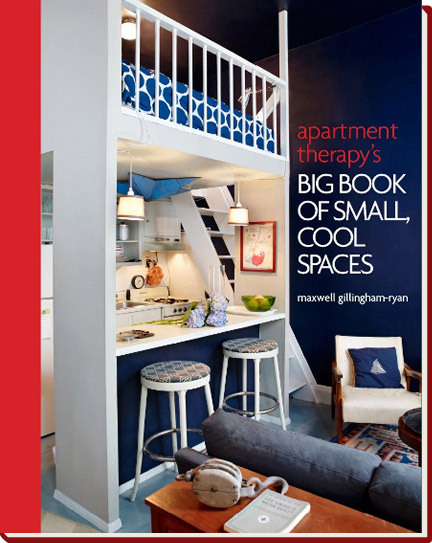 Today's give-away is one of the latest books from Apartments' therapy editor Maxwell Glingham Ryan. I have received this book a month ago and it's just awesome for all of you. So I've decided to run a give-way so that you are all able to win a new copy of the book. Aw I've been literally dreaming about this book for a LONG while now! That would be so awesome to win it, thanks for the great giveaway! I'm in! Am a follower and will RT on Twitter! I'm in. I just started a BIG remodel and I need all those great ideas...love your blog!!!!!! Hi Lise. Great giveaway. I'm a big fan of apartment therapy and I would so love this book. This is a great give away. So many people think you can only decorate well with a lot of space ... and this can really give some great ideas. Great give way! I'm a follower and of course I will RT this give-away!! Needless to say this is a bookshelf staple, and as all Europeans know, living small is chic. It's how you decorate that makes a difference and with our imminent move back North I would love to get my mittens on this one!! Haven't got Twitter but will put a link to this give away on my side bar. Hope that counts as entry no 3. And I'm officially a follower now! i want [deserve!] this book because not only do i love design books, but i also have a bedroom measuring in at 6.5' x 7' so i need all the the inspiration i can get to make it both cool & functional!! oh, & i'm a folloewr! !